Western Prospect with owner/rider Don Stewart at Devon in 1993 – they were Working Hunter Champion that year. 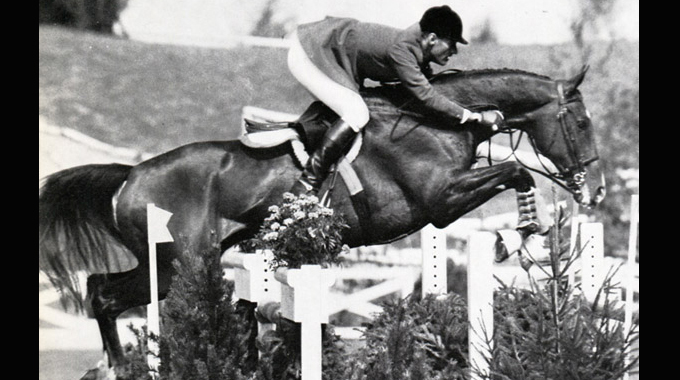 Western Prospect was Grand Champion and Don was Leading Hunter Rider in 1992 at Devon. The beautiful bay Thoroughbred colt that came to be named Western Prospect was born on a warm May day in 1986 at one of the country’s best Thoroughbred farms – John Nerud’s Tartan Farms in Ocala, Florida. This son of Fappiano (by Mr. Prospector), out of the Dr. Fager mare, Explorare, led everyone to have great expectations for him as a top racehorse. He had the look, size, and way of moving for the job. In September of his yearling year, Tartan Farms sent the handsome colt to Kentucky to be sold at Fasig Tipton’s September Yearling Sale. The pinhookers all attended the sale in hopes of finding colts and fillies that they could get broken and, in a few months’ time, send them to one of the Two-Year-Olds In Training sales to be sold for a big profit. The bidding at the yearling sale was fierce for Western Prospect. When the hammer dropped on the final bid of ninety-five thousand dollars ($95,000), it was Richard Shockey, Jr. of Maryland’s Shockey Equine Management that bought the colt. After six months of training, Western Prospect was shipped back to his home state of Florida to be sold at the Fasig Tipton Selected Two-Year-Olds In Training Sale in March. This time, it was not just his beauty that interested buyers, but also his way of moving as he galloped around the track at Gulfstream Park. Will Farish, one of the leading owners and breeders of top racehorses in the world, liked what he saw in Western Prospect. Mr. Farish bought him for two hundred fifty thousand dollars ($250,000). The price was just twenty-five thousand dollars ($25,000) shy of the sale-topper (a colt by Triple Crown winner, Seattle Slew). After the sale, Western Prospect was shipped to Mr. Farish’s Camden Training Center in Camden, South Carolina, for more training and prep for his life as a racehorse. It was there that Andrea King first saw Western Prospect. At the time, she broke and rode Mr. Farish’s two-year-olds, as well as having her own show horses. When Western Prospect showed no signs of being a good racehorse, he was sent back to Camden for Andrea King to turn into a show hunter. Andrea had Aaron Vale riding for her at the time. They prepared the handsome 17.0 hand bay gelding, that didn’t want to be a racehorse, for the show ring and started him in the Pre-Greens. He won wherever they showed him. By 1991, at the age of 5, Western Prospect and Aaron were showing in the 1st Year Green Working division at the major A shows. 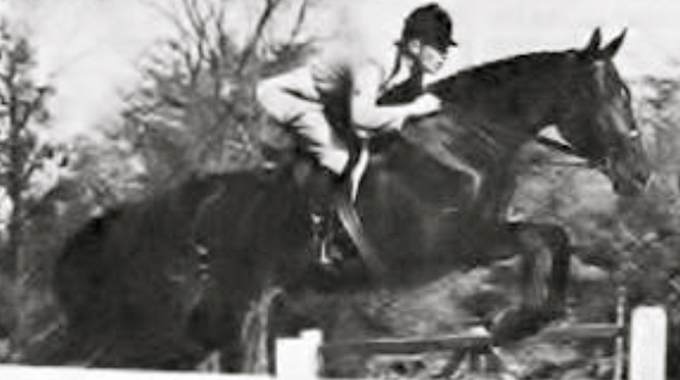 In the Fall, Western Prospect was entered at the Pennsylvania National Horse Show. Don Stewart stepped in and showed him at Harrisburg for Andrea. Western Prospect won the 1st Year Green Working Under Saddle and Don bought him shortly after the show. Showing in the 2nd Year Green Working and Conformation Hunter divisions in 1992, Western Prospect (with Don as owner and rider) was Champion at every show he showed, including all of the Florida shows, Devon, all over the Midwest, plus Pennsylvania National (Harrisburg, PA), Washington International (Capital Centre, Landover, MD), and the National Horse Show (Meadowlands, East Rutherford, NJ). He won almost every Under Saddle class. Western Prospect was Grand Champion at Devon and Don was Leading Rider. He was also Grand Green Champion at Harrisburg in 1992. 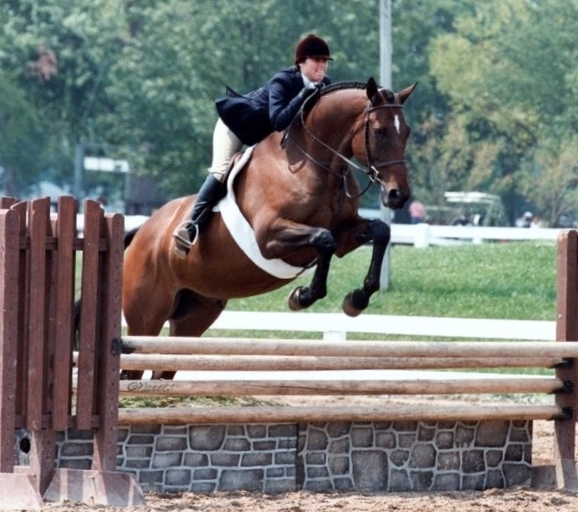 Western Prospect with owner/rider Bryan Baldwin showing in the Adult Amateurs in Kentucky in 1998. As 1993 started with shows in Florida, Western Prospect and Don continued their winning ways in the Working and Conformation divisions over 4’. 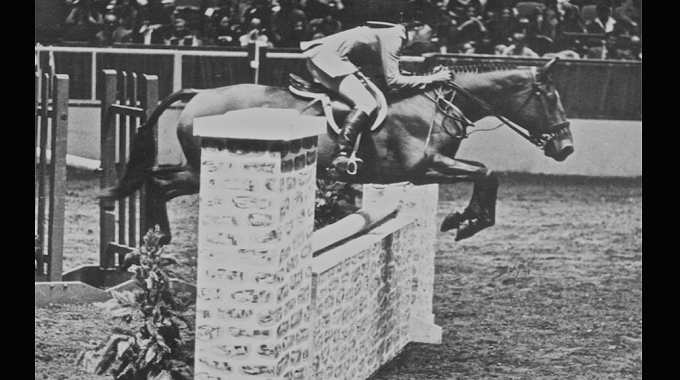 It was during the year that amateur rider Bryan Baldwin came to ride with Don, after having not shown since her childhood. She needed a good horse to show in the Adult Amateurs, so Don recommended Western Prospect. Bryan thought the price was too high for what she wanted. She thought that she’d wait for the price to come down on the lovely bay gelding. Don kept telling Bryan that Western Prospect was the horse for her throughout the Summer, but the price never came down. Finally, right before indoors, Bryan bought Western Prospect. 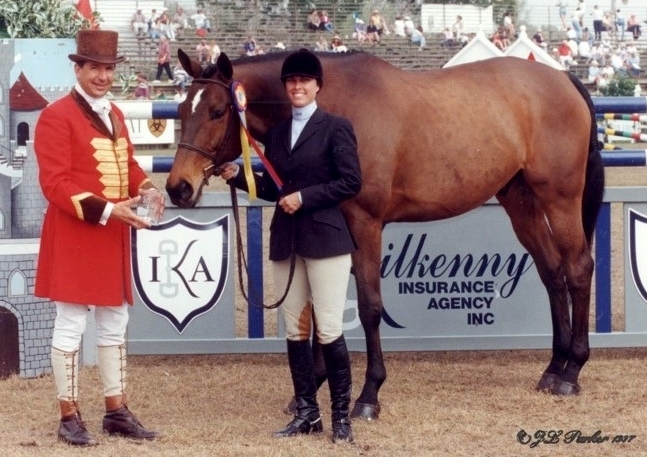 She was rewarded by not only getting a great horse for herself to show, but he was Working Hunter Champion at Washington International that year. Western Prospect with owner/rider Bryan Baldwin receiving an Adult Amateur Champion trophy and ribbon from Ringmaster Bill Venditta in 1997. Photo by James Leslie Parker. Bryan nicknamed her new horse “Pro Pro” and started to show him in the Adult Amateur divisions. 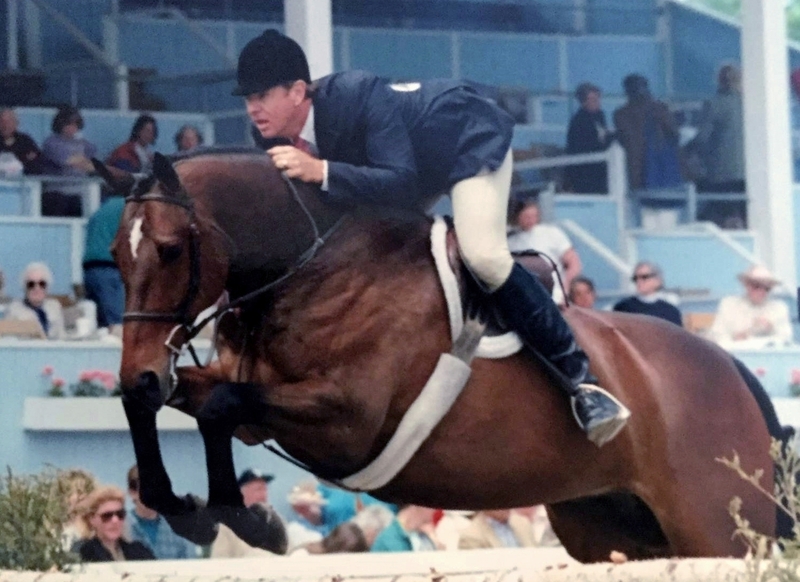 When Don couldn’t leave Ocala to show at the Winter Equestrian Festival in Wellington in 1994, he sent Bryan and Western Prospect to show with Louise Serio for the circuit. Louise showed him in the Working Hunters while Bryan showed him in the Adults. They both were very successful. After the WEF, Western Prospect was returned to Don’s barn for Don to show in the Working division as Bryan continued to show in the Adult Amateurs. This was the program through 1995. After that, Bryan showed him solely in the Adults with Louise Serio as her trainer. Western Prospect was retired in 2002. Bryan remembers Western Prospect as being a real character. He showed that part of his personality when he trotted into the Rost Arena at Wellington, picked up a Palm tree in his mouth, carried it down the length of the ring, and finally dropped it as Bryan asked for a canter. They continued on with the course and won the class. Bryan said that Western Prospect was easy to ride and perfect for her because he was literally a “point and shoot” horse. All Bryan had to do was steer and Western Prospect did the rest. Western Prospect and a young retired polo pony grazing at Chester Bar Farm. Photo by Mimi Gracida Boyle. When Western Prospect retired, after eleven years of showing on the A circuit, Bryan sent him to Mimi Gracida Boyle’s beautiful 600-acre Chester Bar Farm, in the foothills of the Blue Ridge Mountains of North Carolina near the Virginia line, just off of the Blue Ridge Parkway. He lived out his years in a big grassy field with his buddy Valencia and other retirees. Western Prospect passed away on March 22, 2007 from natural causes. Everyone that had anything to do with Western Prospect had the same things to say about him – that he had a remarkable attitude, tried very hard to please, was easy to train, was kind, and was very quiet. He was loved by all that knew him. 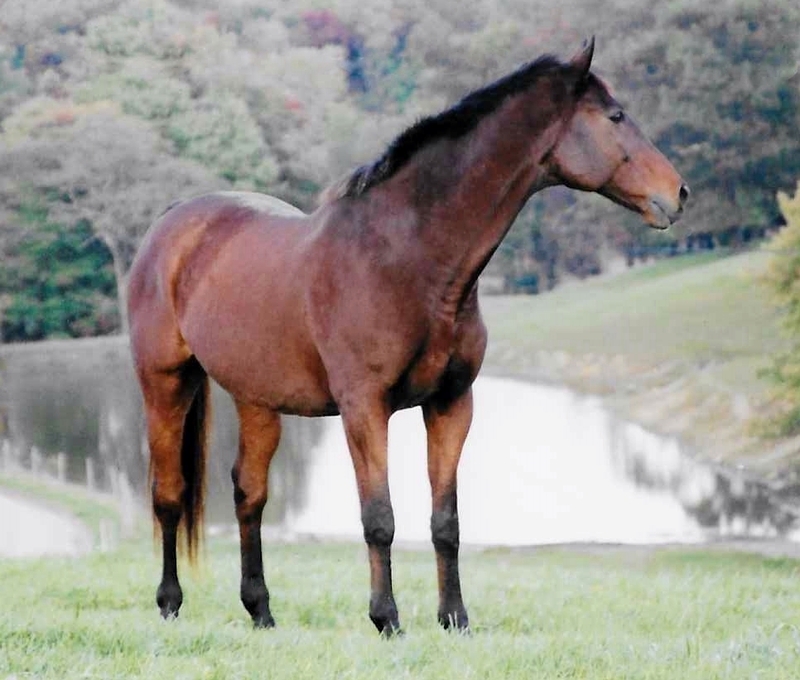 There are not many Thoroughbred show horses that have been bred as well as Western Prospect. A well-bred horse is a well-bred horse. No matter the discipline. Western Prospect may not have been fast enough to be a race horse but he was a terrific show horse and a winner for everyone that showed him. Western Prospect in retirement at Chester Bar Farm. Photo by Mimi Gracida Boyle. Wow, another lovely and fantastic horse and article by Marianne. I laughed out loud with the visual of him carrying the palm tree down the length of the ring. What a marvelous horse and thank you for the fabulous history of this horse. I agree with Lynn Earl Gola McClanahan’s post and also lol when I read about the palm tree. Thank you very much for another wonderful read, Marianne.